Sometimes stats can be misleading. Sometimes stats can lie. And if coaches aren’t smart, bad stats can lead them in the wrong direction. There is a long list of flawed baseball statistics that coaches and baseball fans alike care too much about. But today we’re going to talk specifically about the issues surrounding the defensive error. 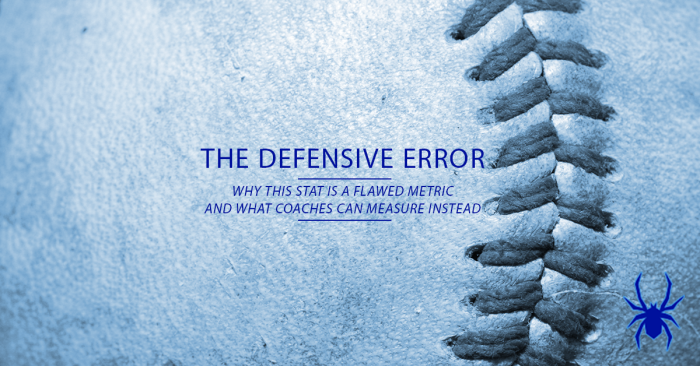 In this post, I’m going to break down why the defensive error is a flawed baseball statistic — especially for the youth game. That flaw can lead to poor evaluations of both hitters and fielders. Additionally, I am going to share an experiment that I’ll be running this fall to approach defensive proficiency in a new way. This is a big, big issue. While what is and isn’t an error may have less disagreement in professional baseball, it is rarely a consensus in the youth game. What is and isn’t an error will often differ based on the scorer or based on the coach. Sometimes it will differ based on the player who hit the ball, fielded the ball or on the mound (due to bias). At the lower levels, a high percentage of ground balls hit to the left side of the infield will result in the batter reaching first safely. As players get older and the competition increases, this percentage increases. But at what point do we determine a play “should” have been made? Is it when that exact play will be made nine of 10 times by players at that level? Or is it eight of 10? Or seven? Too much subjectivity comes into play here. One scorer may call seven errors in a game while another will call zero. This, of course, will drastically alter the way performances are viewed. If the ball is put into play, good things can happen. Sometimes they do, sometimes they don’t. Sometimes the ball is hit poorly. Some of those poorly struck balls will find a hole and result in a hit. Some will be played and result in an out. Sometimes the ball is hit hard. Some of those well hit balls result in a hit. Sometimes they will be hit right at a defender and result in an out. Fewer should result in an out than the poorly hit baseballs, of course. But we recognize that the results aren’t always fair. Whether the ball is hit hard does not always directly correlate to a hit. Then we bring in the error. 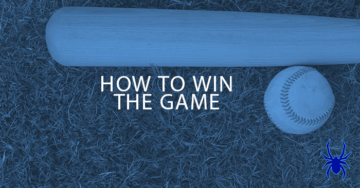 The batter hits the ball — often, but not always, poorly. It is hit to a defender who possibly “should” make the play. He does not. The batter reaches base safely. In the box score, this batter recorded an out. They do not get credit for reaching base, other than under the ROE statistic (this does not increase AVG or OBP). But a hit is not “earned” even though the skill needed to reach base was little different than reaching via a poorly struck ball that found a hole. The thought behind the batter not earning the hit is that the fielder “gave” him the base. 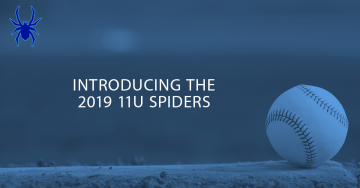 But is this really true, particularly in youth baseball? If a ground ball is hit to the first baseman or a popup to the pitcher, the batter has a choice. He can drop his head and jog slowly to first. If he does, the fielder has more time to fail and recover, still recording an out. A good baseball player will acknowledge that hitting the ball in play gives them a chance. He will immediately sprint to first base, putting more pressure on the defense to make a clean play. If they fail to make a clean play — which happens frequently — the batter will benefit due to his hustle. Here’s the bottom line: In youth baseball, if you put the ball in play, good things often happen. By giving the batter an out in the box score, we aren’t acknowledging that they 1) put the ball in play, and 2) hustled to reach base. Sound baseball players who frequently put the ball in play and consistently hustle will reach base via an “error” far more frequently than bad baseball players who fail to put the ball in play or don’t hustle. We need to account for this. But in the box score, the two both achieved an out while one reached safely. This is a big problem when determining defensive prowess. 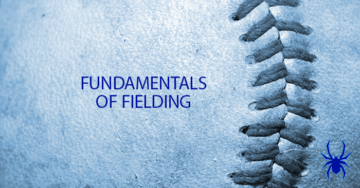 When comparing the defensive skills of two players, we often look first at errors and fielding percentage. But this is hugely flawed due to the issue of range. One player has terrible range. If you don’t hit a ball within five feet of him, he won’t get it. As a result, he converts very few outs. He also will have very few errors because he doesn’t get to enough baseballs to boot or throw them away. Another player has exceptional range. He will get to baseballs no other player can. He is quick and anticipates where the ball is going. He gets to the baseball effortlessly when others would struggle to get there. The player with exceptional range will then get to far more baseballs than the player with good range. While he’ll have more opportunities to convert outs, he’ll have far more opportunities to make errors as well. Assuming these two very different players played the same position, one would never get to a ball or make the play look difficult (no error) while the other would get there easily, increasing the likelihood of an out or an error. Lately, I’ve been keeping a closer eye on the ROE column in offensive statistics. This is a column we tend to ignore, but I feel that’s a big mistake. If the batter put the ball in play and hustled to reach base safely, I want to acknowledge that. At minimum, it’s no worse than a poorly struck ball that found a hole — or was hit in the vicinity of a fielder with poor range. So now I’m going back to look at which batters reached via the error most often. Over and over again, I’m finding it tends to be my better hitters — those who routinely put the ball in play and keep pressure on the defense by hustling to first. This coming fall, I am going to instruct our scorekeeper to no longer score errors for our batters. 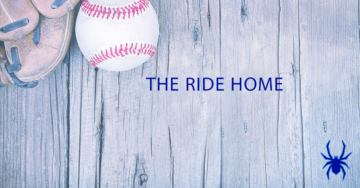 If they put the ball in play and did what they needed to do to reach base safely, they should be rewarded. Once again, we’re going to do things a bit more creatively this fall. As noted, range is a major contributor to whether or not an out can be recorded or an error called. A player with great range should be rewarded, not punished. I am putting together a spreadsheet that a designated defensive scorer will keep for me. That scorer will chart where the ball was hit and whether an out was recorded. Of course, it’s much more complicated than that. We’ll separate the field into zone responsibilities based on position. What zone did the ball pass through? What player owns the zone where it went through? In what zone was the ball recovered? What player owns the zone where the ball was recovered? Which player recovered the ball? What zone does the player who recovered the ball own? The thought here is to first understand how many baseballs passed through a second baseman’s zone, for example (low liners or ground balls). We don’t expect that a second baseman will field 100% of these opportunities, but we want to see who fields the highest percentage (has the greatest range). Additionally, this will help us see which players go outside of their own zone to field a ball (again, a sign of good range) while also noting which player therefore failed to recover it in their own zone (a sign of bad range). I don’t expect this to be perfect in small sample sizes — there are always exceptions and strange plays — but over the course of the season it should give us a clearer picture of range. Understand that there is some minimal subjectivity here, but the data is still valuable. One would think that a high number of popups hit into an infielder’s zone should be recorded for an out. Are they? Additionally, we’ll look at soft grounders to the first baseman’s zone differently than line drives. What percentage of these hits are recorded as outs? These will help us separate the tougher plays from the easier ones when comparing results. Was the hitter out or safe? This can get complicated in a hurry, but the idea here is that we’re now looking at more than just range, but efficiency. A left fielder may have recovered the ball in their zone, but how many bases did the runners advance, and how does that compare to other left fielders? A defensive player has many jobs. They need to recover the ball and convert out. But they also need to limit the number of bases advanced, and this is something that is rarely — if ever — measured or reported. Was the throw caught cleanly? Was the batter or runner retired? It’s good that a fielder recovered the ball, but were they able to convert the out? And if not, whose responsibility was it? This can give us an idea of arm strength, for example. If a third baseman routinely fields the ball cleanly and makes throws that are caught cleanly but don’t result in outs, it may give us an indication of poor arm strength. But the first baseman may also contribute. 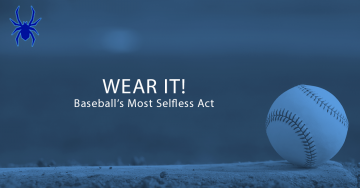 If a low number of balls thrown to first base result in an out — caught cleanly or otherwise — it may tell us that the first baseman may not do a good job of helping his fielders. As you can see, this may be a complicated experiment. We may not chart all of these things, but each action — as well as others — need to be considered. I want this to be as simple as possible while providing valuable insight. It’s possible we may trim this down to be much more basic. How many times was a ball hit to your zone? How many times was an out recorded? What do you think of the defensive error? How do you score it? And what do you think of taking a more creative approach to it?